If you've landed on this page to specifically answer the question, "What is a blast-resistant modular building?" then you've come to the right place. A blast-resistant modular building is a structure that is made to withstand significant explosions and to protect personnel and equipment in hazardous environments like those encountered at oil refineries, chemical processing plants or similar operations. Sometimes they are referred to as blast-resistant modules, blast-resistant units, or simply as a BRB or BRM. A blast-resistant modular building is typically constructed with thick steel walls that can sustain a high level of blast pressure. Inside the building, the nonstructural components of blast-resistant buildings, such as cabinetry, light fixtures, electrical and plumbing, as well as internal fixtures are all designed with these same assurances. What are the Regulations Covering Blast-Resistant Buildings? 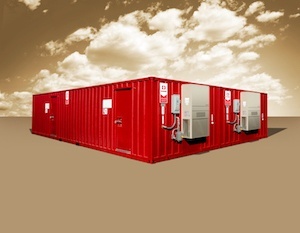 Unfortunately, there are no official regulations that cover blast-resistant modular buildings. There are some recommended practices laid out by the American Petroleum Institute that cover permanent and portable structures that are located within blast zones. These are known as API RP 752/753. They ensure that occupied buildings protect against potential hazards by recommending specific blast response ratings to protect occupants from potential hazards that reside in hazard zones. As a safety authority in blast resistance, RedGuard recommends using only blast-resistant buildings with a low or medium response rating (meaning low- to medium- damage after a blast event). A building with a high response rating, while still considered “blast resistant,” could sustain structural damage during a blast event and may even collapse due to environmental conditions. A high response level is synonymous with injuries, or even worse, fatalities. All RedGuard blast-resistant buildings have either a low or medium blast response rating. So, now you know the answer to "What is a BRB?" and a little about the recommended practices - here's a little bit about purchasing. Blast-resistant buildings for sale come in many shapes, sizes and specifications. Completely customized blast-resistant buildings with office spaces, bathrooms, kitchenettes, and even lockers are all within the realm of possibility. Each customized structure is designed and engineered to customer specifications. Recently, RedGuard introduced standardized blast-resistant offerings that combine some of the popular combinations of amenities found in custom structures. This unique product line is pre-engineered, to pass savings in time and cost along to the customer, and is the first of its kind in the blast-resistant building industry. Can you rent a blast-resistant building? Yes, blast-resistant buildings for rent are easily found. Companies like RedGuard offer the LeaseFleet product line, available in 8’ wide, or 12’ wide, and multi-section options. There are even tool cribs, to protect your irreplaceable equipment. A blast-resistant building rental may be right for those whose needs within the blast zone are temporary, or to use while a permanent blast-resistant structure is being built. Because there are so many variables and options with blast-resistant structures, there is no easy answer about its cost. It will depend on if it is a blast-resistant building lease or sale, and the type of amenities that are requested for the structure. Steps to buying a blast-resistant modular building. Consider starting with a facility siting study. This can help determine hazard zones, and whether existing buildings need to be moved, replaced or retrofitted. If new buildings are needed, determine the specifications for the structure, how the building will be used, desired amenities and aesthetics, location and budget. You can even review these Five Questions to Ask Before Choosing a BRB. Consider the length of time you will need the BRB to determine if you will buy or rent. Get the ball rolling with a quote from a trusted source like RedGuard.